Hello Spellbinder friends and fans! 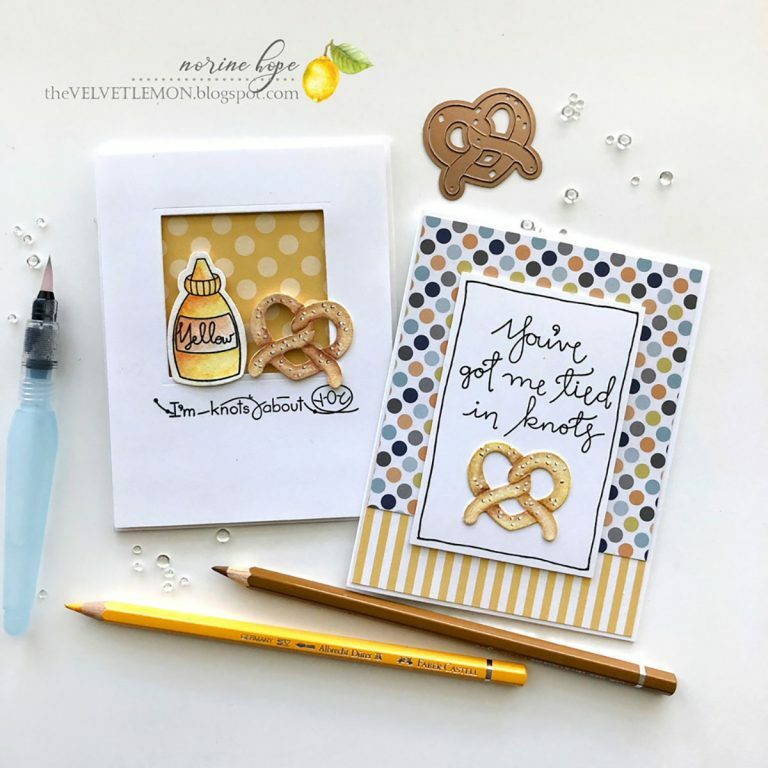 Norine here from The Velvet Lemon (https://thevelvetlemon.blogspot.com) with a couple of cute cards that came out of the just released Perfect Match Collection by Debi Adams! Oh my goodness people. What are your thoughts on puns? If you love them as much as I do, you’re going to enjoy some of the cutest groaners coming that you ever saw! Or heard? 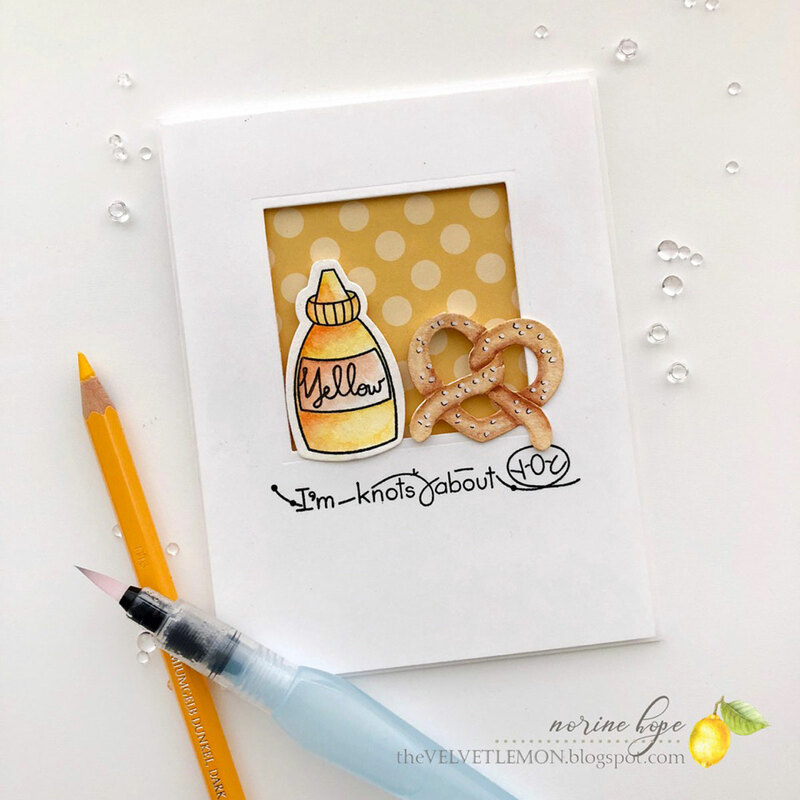 When Spellbinders contacted me several weeks ago, about creating some cards using the new Perfect Match stamps and dies release, I took one look and was all like, oh heck, yes!! I adore the simple line-drawing designs and the cute and funny, clever and punny sentiments that accompany each set! For these cards today I used the stamp and die set called Twisted. 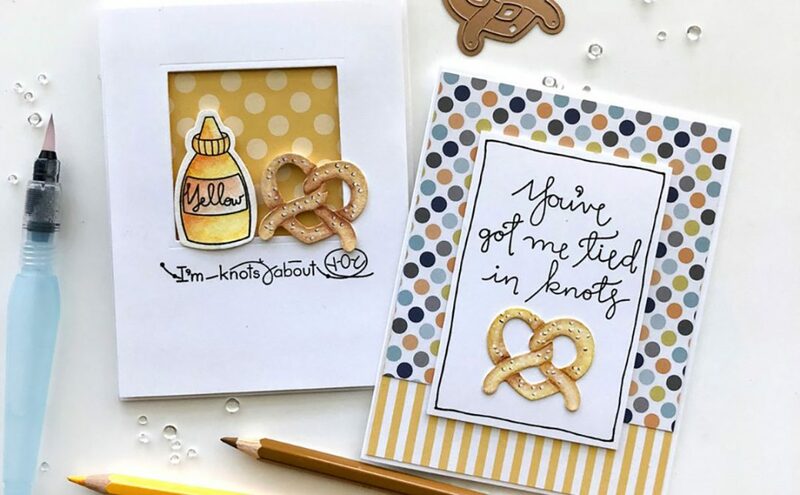 I die cut the pretzels from watercolor paper and colored them with my Faber Castell watercolor pencils, then “painted” them with a water brush. 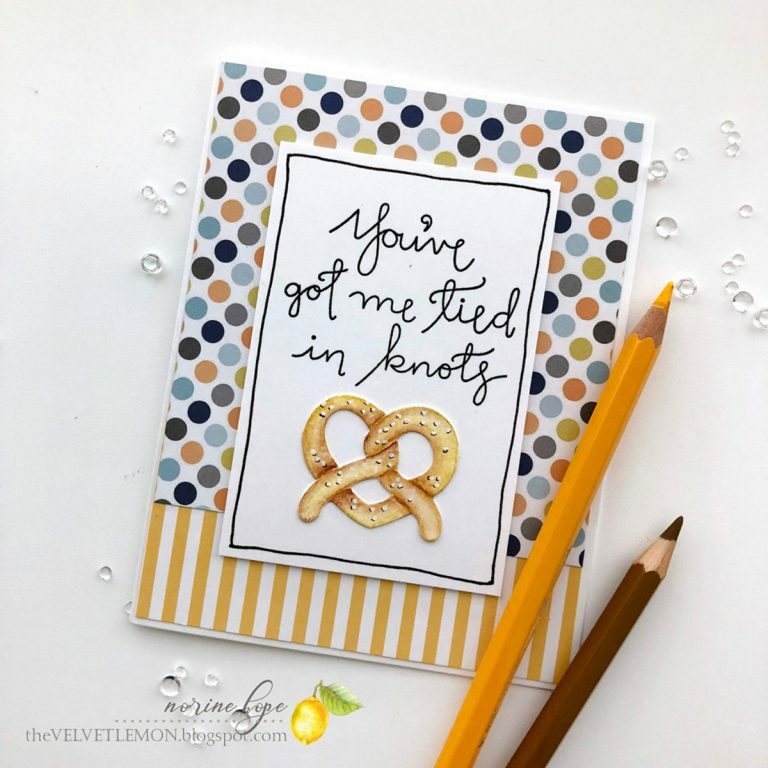 I stamped the larger sentiment on a piece of Neenah Solar White cardstock, drew a wobbly, hand-drawn outline with a Copic Liner pen and layered it over a coordinating patterned paper combo background with dimensional foam tape. See those little salt chunks? Those were made with a white Sharpie Paint Pen, dotting once, letting dry, then dotting a 2nd time for extra vividity. (If that’s not actually a word, it should be). Then I took my 0.3 Copic Liner pen and drew a little “C” under each flake to create the impression of a shadow. 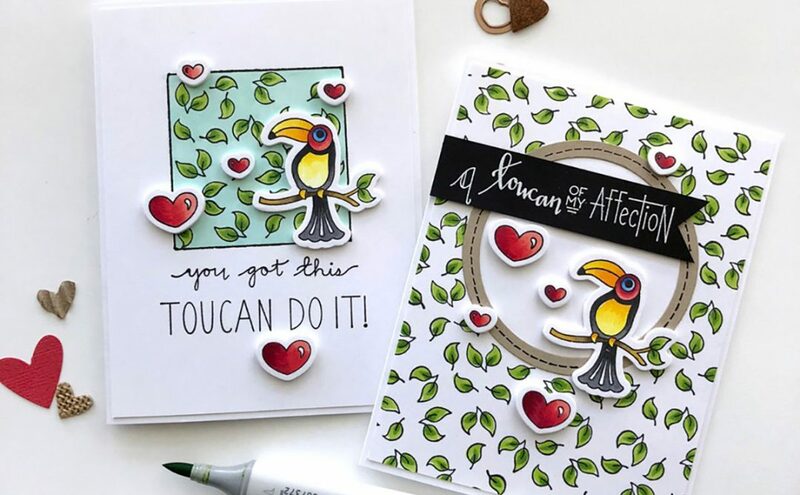 Another thing I love about the Perfect Match Collection release from Debi Adams (besides the cute and clever puns), is the cleanly drawn simplicity of the designs that push the cards in a very CAS (clean and simple) direction. 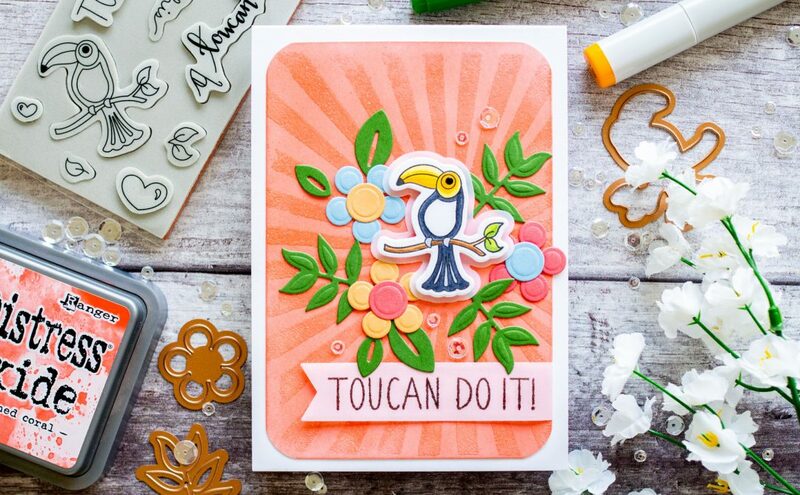 CAS card-making is a challenge for me and more than once I had to slap my hands before the cards were finished, when I would reach for the enamel dots or some coordinating twine. In the end I conquered those urges and i’m ever so pleased with the results! 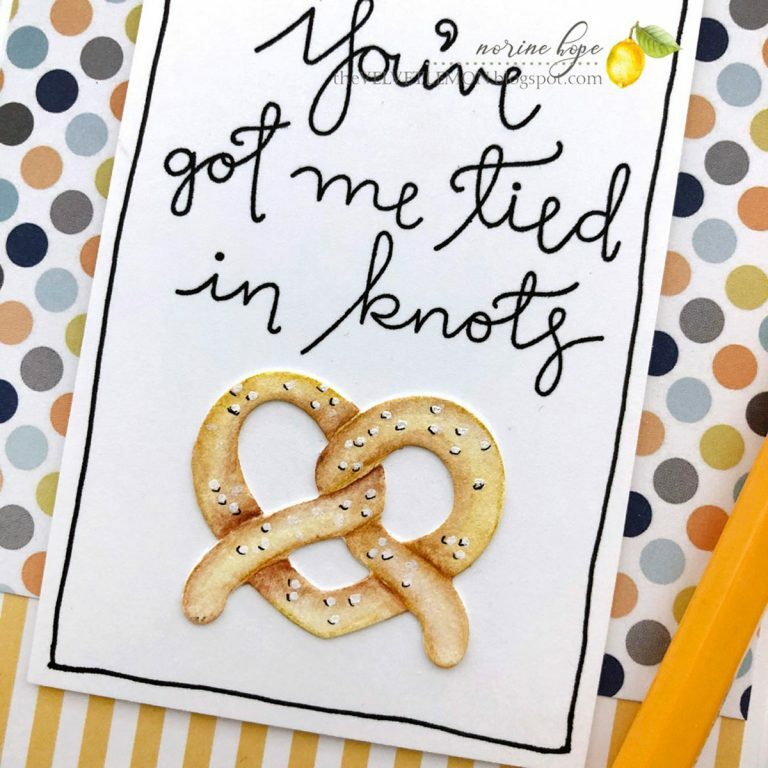 For the next card, I created the pretzel in the same manner as outlined above. I also stamped and die cut the mustard bottle from watercolor paper before coloring and painting it with the Faber Castell watercolor pencils and a water brush. 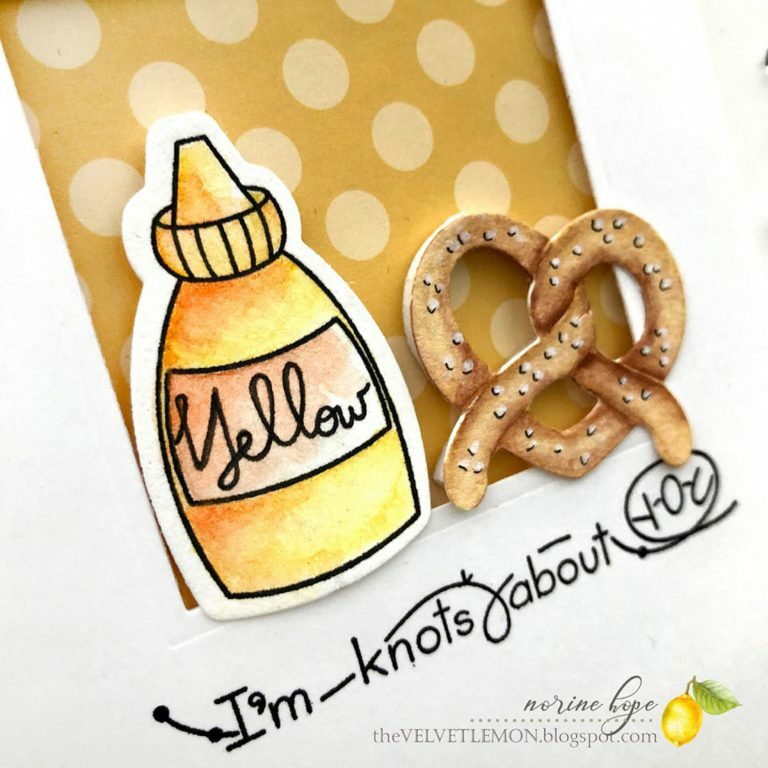 I used the Nestabilities Classic Squares Lg dies to cut an opening into a Neenah Solar White cardstock panel, stamped the sentiment below the opening and popped up both the cardstock panel and the pretzel and mustard bottle with dimensional foam tape, against a patterned paper background. And with Herculean effort, I stopped there! Yay, another point for CAS me! Pink & Main Be Brave 6×6 paper pad, Echo Park Dots & Stripes 6×6 paper pad, Versafine Onyx Black ink pad, Copic Multiliner pens, Faber Castell Albrecht Durer watercolor pencils, Ranger water brush, Sharpie paint pen, 3M foam tape, Neenah Solar White cardstock, Tombow Xtreme permanent adhesive. Thanks for checking out today’s post! 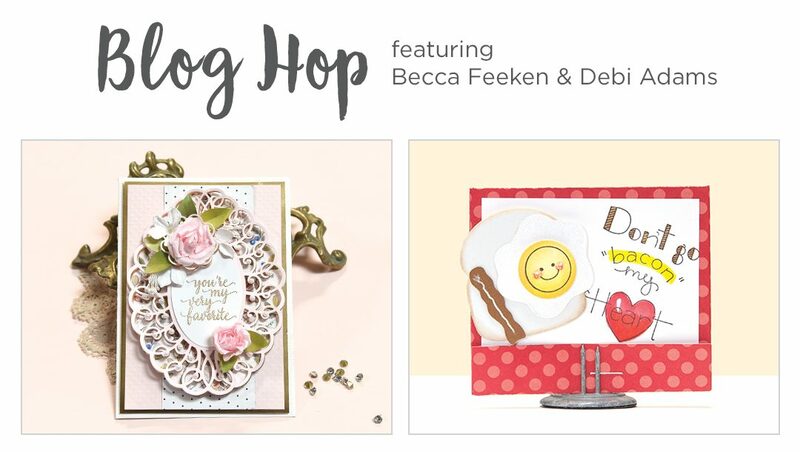 I’ll be back again, later this week, with more cards from the Perfect Match Debi Adams release, and I hope you’ll stop by too! Have a wonderful day!